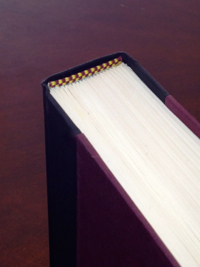 A strip of colored material attached to the text block at the top of the spine of a hard cover book. The same treatment applied to the bottom of the spine is called the tailband. Both may also be called endbands. Traditionally these were made of mercerized cotton or silk sometimes wrapped around a leather core. The endbands were then sewn or stitched onto the text block and the boards to reinforce the binding. Modern printers use end bands mainly as a decorative feature, and they are glued to the text block.